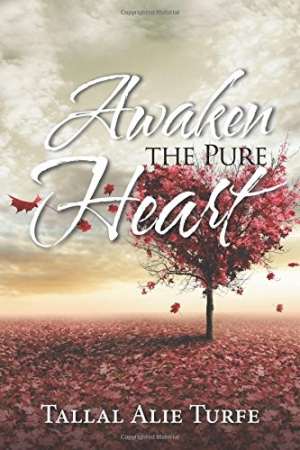 Awaken the Pure Heart will help Muslims and religious omnivores develop self-awareness, empathy, sincerity, humility, personal responsibility, and dependence on God. Tallal Alie Turfe’s Awaken the Pure Heart is a guide to inner healing built on the teachings of Islam. The book claims that the present day is marked by damaged hearts. People live in pain and are no longer in touch with their own needs and desires, much less connected to the peace and guidance of God. While physical heart disease is well known, studied, and discussed, the book asserts that the heart is more than just physical; per the teachings of Islam, it is also the mental, emotional, and spiritual center. Turfe presents a possible path to the pure heart (qalbun saleem) and to a life of alignment with God and peace with others. That path involves practices such as prayer, meditation, and solitude. Such concepts are said to awaken thirst in frantic, self-referential lives, and the book powerfully shows how to accomplish them amid the harried pace of the modern world. Central to the shift to the pure heart are the countercultural virtues of remembrance, patience, devotion, humility, and honesty. Through Turfe’s clear insights, spiritual seekers will see what those virtues look like in the real lives of Muslims. Quotes from the Quran and religious thinkers add depth and varied insight. While the approach is decidedly religious, the book also embraces psychology, finding poignant intersections between the two such as self-awareness and inner healing. Additionally, practices of prayer and fasting, typically thought of as largely spiritually beneficial, are shown to have holistic benefits for the mind and the body. This unified attitude—embracing heart, mind, body, and spirit all at once—makes it clear that malaises of the heart, like doubt, envy, and hatred, need to be treated with the same care and determination as physical diseases. Throughout it all, the book holds unflinchingly to the healing power of Muslim beliefs, practices, and texts. The book is well thought-out, but more than that, it’s deeply felt. Its tone is gentle and caring, yet firm, not hesitating to call out evil and self-deception. The smooth, unhurried pace allows big ideas to build slowly and sink in for maximum life-changing benefit. Clear, uncluttered infographics also make key ideas easy to digest. The passion and commitment of a well-educated yet self-taught Quran teacher come through in the earnestness, openness, and accessibility of the book. The appendixes provide backing for the aims of the book through explorations of the pure heart in the Quran, both in the Sunni and Shia hadith—a bold move of inclusivity and openheartedness.